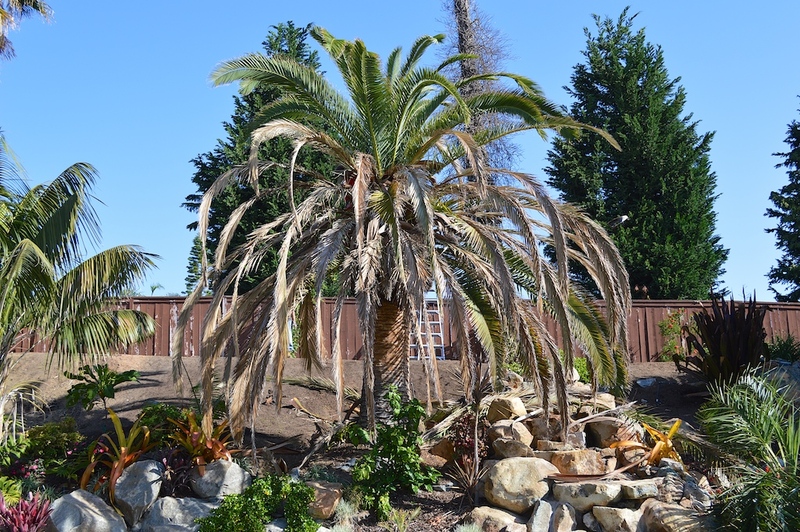 Of these species, the Canary Island Date Palm and Reclinata Palm are documented as being highly susceptible to Fusarium. Fusarium oxysporum is a fungus that infects palm trees by destroying their vascular system (bundles of veins that transport water and nutrients throughout the palm). The fungus enters the palm through wounds typically on their fronds or roots. Once a palm has been infected, the tree will begin to decline over a period of 5 years. Palms infected with Fusarium will show signs on their mid-level fronds (fronds mid to higher up in the crown). These fronds will yellow out of the normal frond life cycle (yellow earlier than normal). The most noticeable characteristic is yellowing and death of one side of the frond first, and then the other side following until the entire frond is dead. I call it the AIDS of Date Palms because there is no cure. Once a palm is infected, there is a 6 – 18 month incubation period where you will not see any signs of the disease. After the incubation period, the palm will start showing above signs and slowly decline over a period of 3 – 5 years. How is it spread? The most common method for infection is contaminated saw blades. Fusarium is a common fungus that lives in soils and other plants. When a saw blade is used to trim a contaminated tree (or even placed in the soil) it becomes contaminated and acts as a vector transferring the fungus. Prevention, prevention, prevention! Although abstinence would prevent the spread, it is not feasible for the majority of us. The best answer is “safe pruning. “ Safe pruning begins with using a sterilized or new hand saw blade. Since hand saws can be sterilized, they are recommended for palms susceptible to this fungus. Do to the complexities of chainsaws, they are not recommended and should never be used with the Phoenix genus. Furthermore, trimming only dead fronds is recommended. Trimming live green fronds creates more entry points for the disease and increases the chances of contamination. One more tip, Fusarium is common in soils, be sure your contractor understands the severity of this fungus and doesn’t place their handsaw in the dirt before trimming. To learn more about best cultural practices for palms – check out our Palm Management Services.